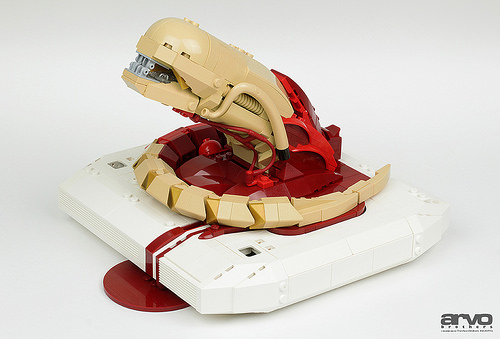 Back in 2007 we blogged an awesome LEGO creation by the Arvo Brothers which featured a chestburster emerging from some unlucky person, in a recreation of a scene from the classic Sci-Fi horror film Alien. Well not only have the Arvo Brothers now updated their build with a base and some new parts to improve the design, but they have also finally published instructions! 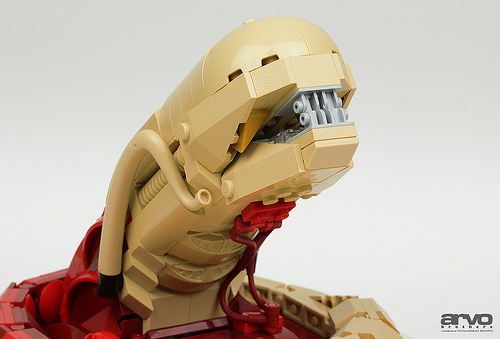 The updated version has a white base similar to the base created for their recent Alien Project and changes to the teeth and nose area. The blood pool also has some fantastic sinewy arterial red parts that add to the horror and seem more anatomically realistic. The seeping blood spilling from the larger pool, through the base and onto the floor, is undoubtedly my favourite part. I hope this doesn’t reflect any morbid tendencies I may have! Building instructions are available by contacting the Arvo Brothers via email arvo@arvobrothers.com and should be on their website soon.